How to Calculate the dasamsa Divisional Horoscope OR Varga Birth Chart , and the Divisions Rulership by Various Deities. Examples along with live example of cricketeer Virat Kohli is given below. In case of dasamsa or the 10th harmonic divisional chart, the lordships of the parts of the 10 parts of the sign are taken from the same sign or rashi for odd signs(like aries(1),Gemini(3) etc) and the lordship is taken from 9th sign is the sign happens to be an even sign. Each of the 10 sub divisions of the sign are of 3 degrees each( we know 3×10=30) .As we know 3×10 Degrees makes 30 degrees a sign. The lord of career in lagna is Venus , is not very comfortable with moon in 5th house, but has the energy exchange of Jupiter. So over all there could be fluctuations in career and job. Note in dasamsa the ascendant lord in on Gemini and hence not very strong, though in Kendra(4th house). Sun the karaka for career rules 6th and sits in the ascendant- so he could face a lot of trouble in job , to his image & also enmity due to this. Career lord is Jupiter in D10, so this suggest teaching jobs, or jobs to do with Vedic sciences like ayurveda or training would suit this guy. All the above predictions are confirmed by real life. 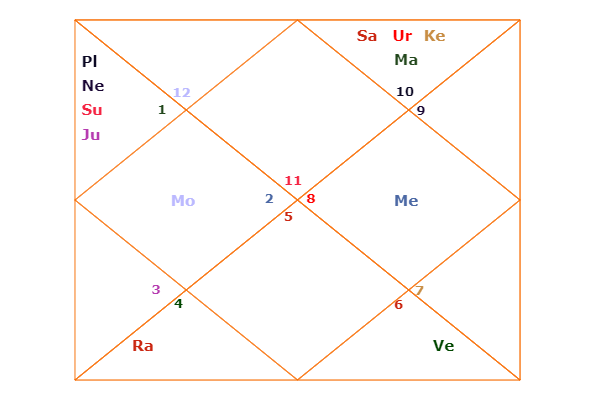 The d10 or dashamsa varga chart analysis for virat Kohli with Birth Time rectifications. As virat kohli’s exact time is not known so first step let us do a birth time rectification for him with a life event? Virat Kohli lost his respected father in the morning hours on December 19, 2006 succumbed to a heart attack. Event used for checking the accuracy of Virat Kohli birth time. virat Kohli was playing a Ranji Trophy match against Karnataka team. in That period he is running mars =mercury sub dasa , mars is the lord of bad health that is twelfth house of virat kohli and is a natural malefic and it affects his mercury, the tenth and seventh lord of relationships and yes career and action. Mercury is close to sun the karaka for father ad in this chart or horoscope with Sagittarius lagna as the lord of ninth bhava or house of father. yes in transit sun is in the twelfth house of bad health in the scorpio sign; Saturn is vet weak in the ninth house of father. father’s heart is by mercury that is impacted by sun a malefic, mars in dasha and sun in transit in twelfth house and also Saturn weak in degree and in enemy sign in the house of father. so create a sever condition for fathers bad health. so this chart could be OK.now let us check one more event. This time he or virat runs rahu Saturn sub dasa. Saturn rules his family house of second bhava and also rahu is in the house of action and initiatives and aspects the seventh bhava of relationships. Now mercury the marriage lord of seventh house has just entered the ninth bhava along with Saturn the lord of marriage at 1.2 degree. There is retrogression as well. Jupiter the causative planet for family for virat kohli is in the eleventh house giving very good energy to natal mercury of virat kohli so supporting marriage. so once again based on the dasha and transits the horoscope of virat kohli would be fairly accurate. More fine tuning or birth time rectification in the horoscope would come with d60, nadi and other techniques, that we will not do it here. let us check the status of the lagna charts or horoscopes tenth lord in which degree is it found in the d10 horoscope? the lord of career for virat is mercury the lord of Virgo sign. this is in the house of gains and benefits that is the eleventh house with the planet of fame and luck that is sun. One has to note that mercury for virat kohli is not combust. so a definite promise of gains and status in career is promised there. the eighth lord moon is also there, so possible sudden loss fop position in moon dasa or in say 2020 when moon energy is strong is there. Venus the blesses of comfort and luxury is the lord of the eleventh house as well is in the tenth house so again promises, gifts money and luxury in career and due to action. What does the d10 or dashamsa chart of virat Kohli say about his career, success and otherwise? now in the d10 chart mercury the lord of tenth house of career is again in the tenth house so making him the action king in his field. mercury is also on the sign of mars that is scorpio so again adds to the action of virat kohli. and yes mars connect closely to cricket and so does Venus as Venus is there in the tenth house in the lagna chart. Mars in the d10 or dashamasa is blessed by the power and leadership of sun in the third house of action one can see and also blessed with grace of Jupiter or guru the lord of gains and yes wealth flows and status the second bhava of virat kohli. so over all a bombastic combination for success, money and grace of GOD and leadership position is indicated in the d10 chart of virat kohli. Mula nakshatra in the lagna makes him ambitious and yes handsome and turned to philosophy; all is reflected in the game of cricket for virat kohli. but yes also prone to marital discord, note he has mar in the fourth house in this natal chart. we wish him success and GOD will protect him on this. but due mula nakshatra or star gives him the drive to be at the top of anything and also moon makes him liked, successful and stable. the philosophy is reflected in the d10 chart as well with the lagan lord being Aquarius.